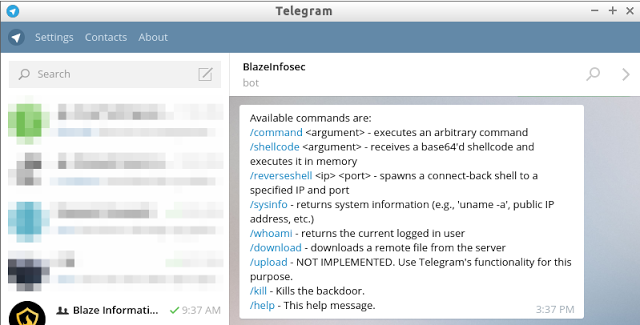 bt2 is a Python-based backdoor in form of a IM bot that uses the infrastructure and the feature-rich bot API provided by Telegram, slightly repurposing its communication platform to act as a C&C. PS: Telepot requires minimum of requests 2.9.1 to work properly. Currently the shellcode execution component is dependent on ctypes and works only on Windows platforms. Before using this code one has to register a bot with Telegram. This can be done by talking to Botfather – after setting up the name for the bot and username you will get a key that will be used to interact with the bot API. Also, it is highly advisable to replace ‘botmaster ID’ with the ID of the master, locking the communication between the bot to the specific ID of the botmaster to avoid abuse from unauthorized parties. After launching a reverse shell and exiting from it, all commands sent to the bot have duplicate responses. The ‘kill’ functionality is not working as it should. After successful execution of shellcode, the bot dies. Upon return it fetches the previous messages from the server and executes the shellcode again. Need to find a way to avoid fetching of previous messages.